Happy Friday, dear readers. 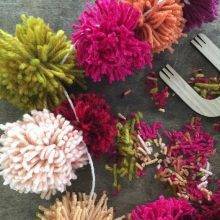 We avidly follow The Loome’s Instagram stories for a daily dose of sunshiney pom poms, tassels, and other happiness-givers that a person with a Loome Tool can make. 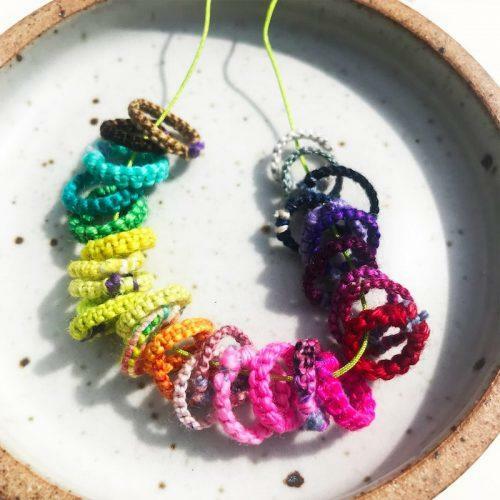 Recently, Vilasinee Bunnag used her Loome Tool to turn out lovely little rings of cord; she suggested them as friendship gifts for springtime. That was great, but what we saw in these rings was STITCH MARKERS. 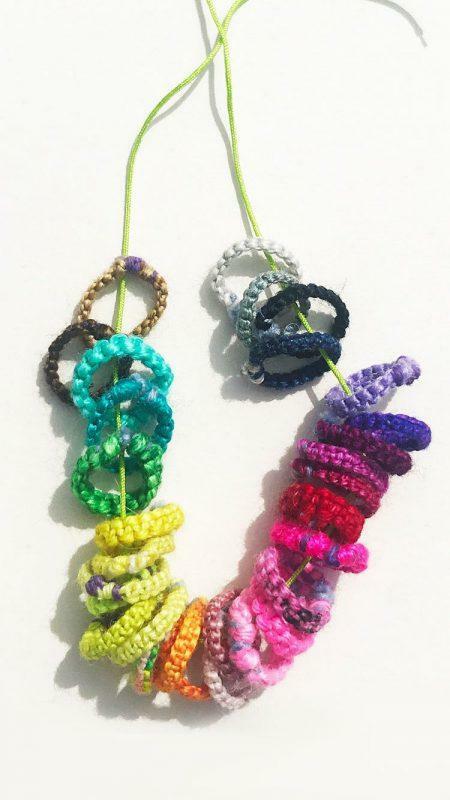 Soft, colorful stitch markers made with those precious short lengths of leftover yarn that we can’t bear to toss. We fired off a note to Vilasinee. Could she teach us how to make them, please? Readers, she could. 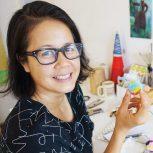 Today, in the cheery video up top, Vilasinee shows how simple and fast (2-5 minutes!) it is to make stitch markers (or rings, or bracelets, or cords, really), with the Loome Tool. If you’ve got a Loome Tool and some precious scraps of yarn, you’re all set. 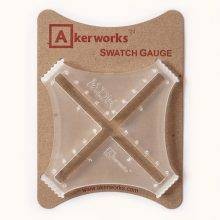 If not, we happen to have them in the MDK Shop. Next time you need a quick, personal gift for a knitter, whip up some soft stitch markers. Also: want to get more fun out of your Loome Tool? 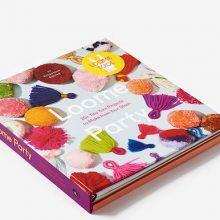 The Loome Tool YouTube channel has snappy how-tos on virtually everything that can be made on a Loome Tool, from pom poms and tassels to cords and miniature weavings. There's more to do with yarn than knit it. But knitting it is excellent. Interesting. 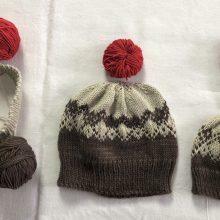 Or, you could just take a piece of bright yarn about three inches long, double it over and tie a knot in it. I never use anything else as stitch markers. I’ve been doing yarn stitch markers for years. Embroidery floss works well too. Different colors can mark pattern changes as well. Me too, but I am totally digging this as a way to make button loops! Beautiful stitch markers! What fun! Can never have enough, right? For me, stitch markers are in the category of “supply” not “tool.” I don’t lose them every day but I lose them a lot apparently. These are fun & solve the biggest problem I’ve always had with using yarn as a marker. 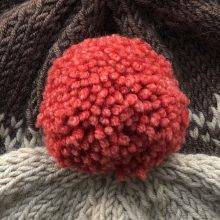 If you touch-knit, you want a marker to feel different enough that your fingers know they’ve reached an action point. With scraps of yarn, there is no tactile difference. With these knotted rings, there is. 2 thumbs up. You are so right. I can’t tell you how many times I’ve nearly knitted an improvised yarn-loop marker into my work, or just knocked it off the needle without noticing. I like that these markers have a little heft. And of course a metal or plastic marker does me just fine, minus the beauty of these soft ones. A lovely gift for a knitting friend! Lots of loomed stitch markers, on a longer loomed cord that can also be a necklace…. fabulous. I just use little rubber bands – the kind they sell for doing braids or Loop Jewelry. A few dollars will buy you hundreds, and you can leave them in place to mark your last decreases (when making sleeves or other shaping) and cut them out when finishing. Best tip I ever learned from a knitting instructor at my LYS. Genius! I love these and no more rubber / plastic stitch markers in the world is a big plus! !